The course of recent political events has become an object of countless studies to measure Turkey’s steady tilt toward authoritarianism in all facets and layers of political conduct.According to the common view upheld by international organizations and media outlets, Turkey is no longer a democracy it once was. The breakdown of rule of law and the collapse of central pillars of democracy have become crystal clear in the aftermath of a failed coup attempt in 2016. One of the less noticed or under-studied theme was the government’s policies on culture. The culture emerged as a key source of impassioned debate or a political war as the government’s critical stance on Western-oriented art institutions generated fresh controversy in the past few months. This report wants to shed light on another notorious aspect of the post-coup purge and crackdown. The government not only launched a new cultural war to reshape the secular nature of the political system but also went on a full-fledged crusade to eradicate certain cultural institutions affiliated with leftist, secular, Kurdish groups. The health industry is among the variety of industries that have been affected in association with those actions. Hospitals, medical schools and health clinics have been shut down. Thousands of doctors, nurses, pharmacists, scientific publishers and health authorities have been dismissed from their jobs. Many of those have been detained and/or arrested and are now serving prison sentences for baseless charges of belonging to what they call a “terrorist” group. Human rights organizations have also recently reported that arrested individuals have been subjected to severe torture and mistreatments. Turkey’s passage over the threshold from Partly Free to Not Free is the culmination of a long and accelerating slide in Freedom in The World. The country’s score has been in free fall since 2014 due to an escalating series of assults on the press, social media users, protesters, political parties, the judiciary, and the electoral system, as President Recep Tayyip Erdoğan fights to impose personalized control over the state and society in a deteriorating domestic and regional security environment. For more than two years, Turkey’s aggressive policy to take over and shut down schools operated by opponents of President Recep Tayyip Erdogan across the world has produced mixed results. In some countries such as Pakistan, Somalia, Gabon and Malaysia, the Turkish government’s relentless pursuit and sweetening financial offers swayed local governments’ positions and led to the takeover of Turkish schools previously ran by non-governmental organizations affiliated with U.S.-based cleric Fethullah Gulen, the arch-nemesis of President Erdogan. But not every country conceded to Ankara’s demands. And in some countries, Ankara led Maarif Foundation has shown signs of poor management and has failed to deliver success in education. Erdogan’s government does not only target Turkish citizens but also people from other nationalities who reside legally in Turkey. The situation raises concern about the non-citizens’ human rights in relation to detention and arrest. Main principle of the rights of non-citizens has been seen as the principle of equality, meaning that state must treat non-citizens as same with their citizens. However, recently this understanding has started to change and there have been new and higher standards protecting aliens. This document will refer to human rights documents protecting the rights of non-citizens in terms of detention and then will include the stories of foreign citizens have been either taken into custody or arrested. In addition, arrested consular officials of the US Consulates will be mentioned despite the fact that they should have been treated with diplomatic respect. Property rights in Turkey are no longer protected because of the disregard the Erdogan government has shown to the rights of its dissidents. 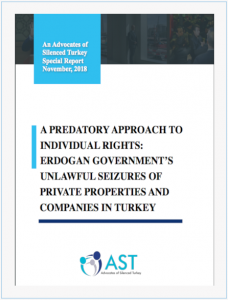 Even though the anti-government Turks suffer from many different rights violations, the violations of the right to property should be separately noted since it is deemed a fundamental human right. “Every natural or legal person is entitled to the peaceful enjoyment of his possessions” reads Article 1 of Protocol 1 to the European Convention on Human Rights. To the astonishment of the whole world last week, September 6, Turkey’s National Intelligence Organization (MIT) and its Moldovan counterpart acted together in snatching six Turkish nationals affiliated with Gulen Movement from Moldovan territory, triggering a wave of international criticism and opprobrium against Moldova’s authorities for their acquiescence to Ankara’s demand for the expulsion of teachers. How the incident took place, the nature of international calls to stop the deportation of education officials working for Orizont High School, and the failure or complicity of the Moldovan political leadership generated a great deal of controversy, bringing their possible collaboration with the Turkish government in the whole drama into sharper international focus. Under the state of emergency in place since July 2016, the president presides over the cabinet, which can pass decrees without parliamentary scrutiny or the possibility of appeal to the constitutional court. 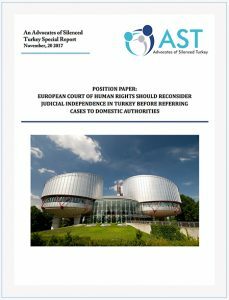 Many decrees adopted contained measures that undermine human rights safeguards and conflict with Turkey’s international human rights obligations. Erdoğan government’s education policy consists of generalizing the imam hatip high- schools which provide mainly religious education, and forcing the students to choose one of these schools. In addition to this, it has been approximately 20 years since AKP (Justice and Development Party) took over the country, and the education system has been changing too many times within this period, only to end up with a more complicated system which has been far from providing any benefits at all. Erdoğan, kurdurduğu Maarif Vakfı üzerinden yurtdışında bulunan Hizmet Hareketine bağlı okul ve bağlı kuruluşlara el konulması için Devlet destekli bir el koyma operasyonu başlattı. Bizzat Maarif vakfı başkanının da bir röportajda ifade ettiği üzere Maarif vakfı hedef olarak yurtdışındaki Türk okullarına hukuksuz biçimde el konulmasını belirlemiş durumda. Zengin imkanlarla donatılan Maarif vakfı bugüne kadar hukuksuzca el konulan Hizmet hareketi okulları dışında yalnızca bir okul kurabilmiş durumdadır. Since the attempted coup of July 15, 2016 the Government of Turkey Turkish government has engaged in illegal extraterritorial and extrajudicial actions been taking strict measures to silence dissidents in other countries from various ideologies recently. There are many examples of abductions and physical violence incidents in several countries as well as threats by pro-government people referring to the supporters abroad. This paper discusses these issues to conclude that individuals linked to the Movement cannot feel safe abroad either. Following months of speculation about possible early elections, on April 16, 2018, the anniversary of the controversial 2017 referendum, Devlet Bahceli, the leader of the Nationalist Action Party (MHP), called for early elections to be held on August 26, the national holiday. One of the main reasons for early elections is to ensure they take place before the upcoming economic depression. There are concerns that the ruling Justice and Development Party (AKP) will commit electoral fraud. Following the April 18 announcement of the decision to hold early elections, on April 24 the Monitoring Committee of the Council of Europe’s Parliamentary Assembly (PACE) recommended that Turkey postpone the elections. 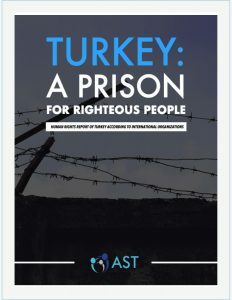 This report prepared by the Advocates of Silenced Turkey’s Right to Life Committee provides an overview of official reports published by the Office of the United Nations High Commissioner for Human Rights, the Human Rights Watch, Amnesty International, and the US Department’s State’s Bureau of Democracy, Human Rights, and Labor. According to the Human Rights Association, the total number of human rights violations amounted to 7,907 since 2016. 2,278 victims faced torture and maltreatment while 423 of such cases took place under police detention. Especially in recent years, freedom of religion has been under attack in most countries with the rise of oppressive regimes. Turkey is also one of these states limiting religious freedoms. Different religious communities took their shares from the government’s arbitrary implementations. This paper elaborates on the different types of discriminatory practices religious groups have been facing in Turkey recently. It will be evaluated whether freedom of religion and belief is respected at the level required the internationally accepted standards. Therefore, for the purpose of this paper different statements from government officials as well as the government’s actions targeting religious groups will be mentioned below. Erdoğan hükümeti, iktidardaki varlığını 2013 yılında hakkında çıkan yolsuzluk iddialarından beri kutuplaşma ve oluşturulan kontrollü siyasi krizlerle sürdürüyor. İki yıla yakın bir süredir OHAL ile yönetilmekte olan Türkiye’de artık hukukun üstünlüğü değil, hükümet tarafından sınırsızca kullanılan “Devletin Ezici Gücü” ülkeye yön verir oldu. Adalet teşkilatının yarısının görevden alınıp binlerce hakim ve savcının terörist suçlamasıyla hapse atıldığı Türkiye’de, hükümetin istemediği yönde tek bir karar dahi almak mümkün değil. It can be seen that Mr. Erdogan’s government, acting without any consideration of rules, the Turkish judiciary and other executive organs which do not raise against any of Mr. Erdogan’s political claims are ready to take any action in order to somehow extradict the people from abroad. 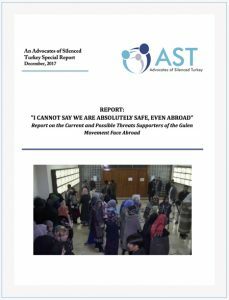 For this reason, any future requests to be made through the Turkish government, especially regarding extraditions of lawbreakers and limitations of traveling abroad, are subject to be investigated to the maximum extent so that to prevent abuses. The report talks mainly about the recent activities of the Turkish government putting education at risk through illegal takeovers by Turkish government sponsored Maarif Foundation. The government for a long time has been trying to “Islamize” Turkey’s education system by placing imam hatip high schools in the center of the education policies. Nearly for one and a half year, the Turkish government has also been attempting to export its policy abroad by taking over Turkish schools founded years ago around the world by participants of the Hizmet Movement. 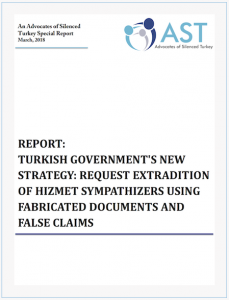 Following the excerpt from the JWF’s report which will provide background information on the case, new information acquired by the Advocates of Silenced Turkey will be provided aiming to illustrate the current situation. Turkish government has been targeting dissidents from various ideologies recently. One of these opposition groups, the Gulen Movement, has been the main target since 2013. The supporters of the Movement have been dealing with different strict measures perpetrated directly by the state authorities such as arrest, imprisonment, torture, inhuman and degrading treatment, denial of fair trial, confiscation, passport cancellations and labeling. 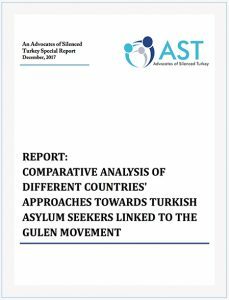 These asylum seekers have been receiving affirmative responses in many countries, four of which are explored in this study. Gulen Movement (also known as “Hizmet Movement,” meaning service in Turkish) has been the main target of the government, which is a faith-based group of people engaging in different voluntary activitiessuch as education, business and health. Alleged supporters of the Movement in Turkey have been dealing with arrest, imprisonment, torture, inhuman and degrading treatment, confiscation and passport seizure. Regrettably Turkish government’s actions against the Gulen Movement are not limited to Turkish borders but are also extraterritorial. There are many examples of abductions and physical violence incidents in several countries as well as threats by pro-government people referring to the supporters abroad. In recent years and in particular in the aftermath of attempted coup of July 15, 2016, the Turkish government has been targeting dissidents belonging to different ideologies. Among the many dissident groups, in particular the Gulen Movement has been the primary target. The far-reaching, increasingly repressive and almost unlimited discretionary powers exercised by the Turkish authorities during the state of emergency – now in its 15th month – endanger the general principles of rule of law and human rights safeguards, the ones the state of emergency is designed to protect.